What’s half bus, half boat, and quacks like a duck? The Aquaduck is something of a Gold Coast icon. If you’ve been anywhere near Surfers Paradise in the last 18+ years, you’ve likely seen it roaring down the road or gliding across the canals of the Broadwater. It’s a giant open air bus with a happy duck’s face painted on the prow. The Aquaduck is an amphibious vehicle, meaning that it can travel on both land and water. Since 2000, Aquaduck has provided 2.2 million passengers with land and sea tours of Surfers Paradise and the picturesque Gold Coast Broadwater. On land, it’s an open air bus – but the real fun begins as it rolls into the water and becomes a comfortable cruise boat. Despite having lived on the Gold Coast for years, and whilst we’ve always wondered what one would be like, Greg and I have never done an Aquaduck safari before. When my sister told me she was taking my nephew, 6, and my niece, 3, we jumped at the opportunity to come along and experience it for ourselves. The tour is only an hour long, and there are up to 14 tours daily, so it’s easy to squeeze into even an already full day of sightseeing. If you’re centrally located in Surfers Paradise, Aquaduck headquarters are conveniently located on Cavill Avenue, Surfers’ main road. It’s central to many of Surfers Paradise’s resorts, malls, and most popular restaurants. If you’re not already in Surfers Paradise, we highly recommend using the Gold Coast’s light rail system, G-link, to park and ride into Cavill Avenue. You will likely find it far less expensive, and less stressful, than trying to drive through the busy city streets and find a park, particularly if you’re visiting in peak tourist times. The G-link is fast, affordable and comfortable, and Aquaduck headquarters are only a short walk from the Cavill Avenue station. If you do decide to drive in and park, be careful of metered parks and parking signage. There is paid parking underneath Paradise Centre, but this can get expensive. Ticket prices are $40 per adult, $30 per child (2 – 16 years), $37 for seniors and $132 for families (2 adults, 2 children). These can be purchased ahead of time online or at the kiosk. Bear in mind, though, that lines get long. Hit the kiosk well before your intended tour time to avoid disappointment. 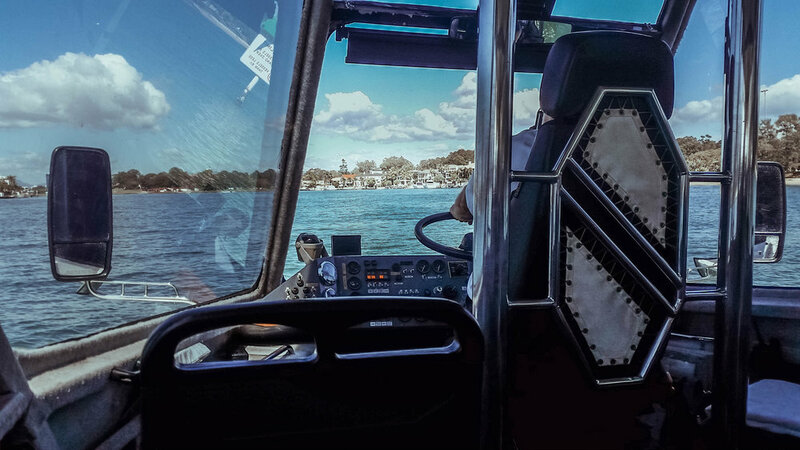 The Aquaduck holds up to 30 passengers at a time and is manned by drivers who are both certified coxswains and licensed truck drivers, as well as first aid trained, so they are very experienced and specially qualified. The vehicle is meticulously maintained. It is fully refurbished every 7 years and comes equipped with 200% flotation life vests for every person on board. Even though Aquaduck has never had an injury or safety incident in its almost 20 years of operation, each staff member completes a monthly safety training drill. The vehicle must comply with a full safety audit every 6 months and is consistently maintained by qualified mechanics. We certainly felt very safe and secure whilst onboard the Aquaduck! You can read more about its safety standards here. After getting our online tickets scanned, we dashed across the road from the headquarters, where the Aquaduck was parked. Up close, it’s even more of a mammoth than it looks at a glance. We had to climb a steep set of stairs to board. Once inside, we chose a seat up front (there is the option of a sideways seat or front facing). The vehicle is open air at the sides, with enclosed glass windows up the front. When everyone had boarded, we were joined by the skipper and our cheerful tour guide and the vehicle rumbled into life. The Aquaduck moved down the Esplanade and along the beach, as the knowledgeable tour guide shared some facts about the Aquaduck and Surfers Paradise. The Aquaduck himself even chimed in with the odd quack here and there – the kids loved it. Before long, we reached the boat ramp and our skipper told us to hang on. With a delighted quack from the Aquaduck, we rolled into the water. It was a surreal feeling. There was a flashing moment of irrational terror that we’d sink like a stone and then we were cruising serenely through the Gold Coast Broadwater. Strangely enough, in spite of the fact that I am dreadful with seasickness, the motion sickness I had felt on dry land abated the instant we started cruising the Broadwater. The motion of the boat is incredibly smooth and comfortable. I didn’t get seasick at all. Got a spare $10 million? Getting a glimpse into the lifestyles of the rich and famous from the Broadwater. Though we had observed it over 100 times from the shore, we saw the Gold Coast Broadwater from a whole new perspective that morning. We saw large luxury yachts and watched jet skis careen by and gazed at the beach of the Spit. The warm Queensland sun streamed onto our skin and the divine salty coastal breeze drifted through our open air boat. As we floated up the Broadwater, all the kids on board were given a turn to be the boat’s captain. They were allowed to steer the boat under the watchful guidance of the skipper and were presented with a little Aquaduck captain’s certificate at the end. Mr 6 and Miss 3 were absolutely thrilled. We went past Sea World, where we got to view a chopper launching into the air. The tour guide offered us the opportunity to purchase souvenirs. There were duck whistles ($5), plush ducks ($15), plush Aquaducks ($15) and captain’s hats ($15). Mr 6 and Miss 3 were delighted with their duck whistles. Before long, our vehicle was chugging along the Broadwater to the cacophonous chorus of a dozen duck whistles being repeatedly blown. At the north end of the Spit, our Aquaduck emerged from the water onto the boat ramp, and we rumbled back down Main Beach, past Sea World and Marina Mirage toward Surfers Paradise. Within 10 minutes we were back at headquarters and our tour had come to a close. Our hour had only felt like 15 minutes! Even if you have been a Gold Coaster all your life, or have visited multiple times, the Aquaduck allows you to see the Gold Coast from a whole new perspective. Fun, relaxing, entertaining, and unique, we think it’s one of Surfers Paradise’s must-dos.